The Last Poets is the name for several groups of poets and musicians who arose from the late 1960s African-American civil rights movement's black nationalist movement. The name is taken from a poem by the South African revolutionary poet Keorapetse Kgositsile, who believed he was in the last era of poetry before guns would take over. The original users of that name were the trio of Felipe Luciano, Gylan Kain, and David Nelson. However, it is the versions of the group led by Jalaluddin Masur Nuriddin and/or Umar Bin Hassan that have penetrated mass culture to a legendary degree. The Last Poets have been cited as one of the earliest influences on hip-hop music. Critic Jason Ankeny wrote: "With their politically charged raps, taut rhythms, and dedication to raising African-American consciousness, the Last Poets almost single-handedly laid the groundwork for the emergence of hip-hop." The British music magazine NME stated, "Serious spokesmen like Gil Scott-Heron, The Last Poets, and later Gary Byrd, paved the way for the many socially committed Black [emcees] a decade later." The Original Last Poets were formed on May 19, 1968 (Malcolm X's birthday), at Marcus Garvey Park in East Harlem. Luciano, Kain, and Nelson recorded separately as The Original Last Poets, gaining some renown as the soundtrack artists of the 1971 film Right On! In 1972, they appeared on Black Forum Records album Black Spirits - Festival Of New Black Poets In America with "And See Her Image In The River" and "Song of Ditla, part II", recorded live at the Apollo Theatre, Harlem, New York. A book of the same name was published by Random House (1972 - ISBN 9780394476209). The Jalal-led group coalesced via a 1969 Harlem writers' workshop known as East Wind. Jalal Mansur Nuriddin a.k.a. Alafia Pudim, Umar Bin Hassan, and Abiodun Oyewole, along with poet Sulaiman El-Hadi and percussionist Nilaja Obabi, are generally considered the best-known members of the various lineups. Jalal, Umar, and Nilaja appeared on the group's 1970 self-titled debut LP and follow-up This Is Madness. Nilija then left, and a third poet, Sulaiman El-Hadi, was added. This Jalal-Sulaiman version of the group made six albums together but recorded only sporadically without much promotion after 1977. Having reached US Top 10 chart success with its debut album, the Last Poets went on to release the follow-up, This Is Madness, without then-incarcerated Abiodun Oyewole. The album featured more politically charged poetry that resulted in the group being listed under the counter-intelligence program COINTELPRO during the Richard Nixon administration. Hassan left the group following This Is Madness to be replaced by Sulaiman El-Hadi (now deceased) in time for Chastisment (1972). The album introduced a sound the group called "jazzoetry", leaving behind the spare percussion of the previous albums in favor of a blending of jazz and funk instrumentation with poetry. 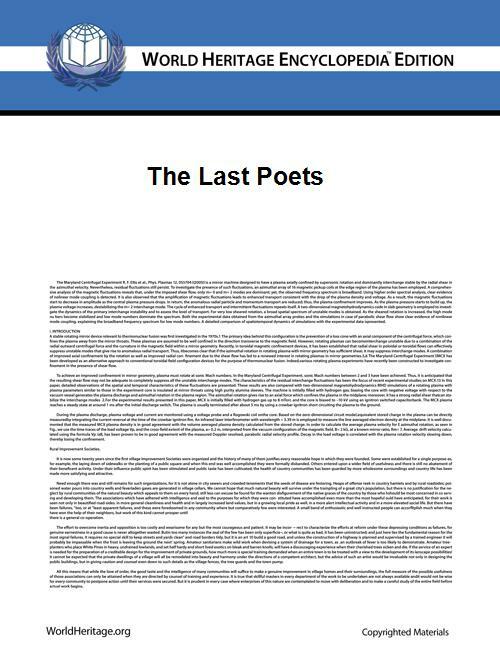 The music further developed into free-jazz–poetry with Hassan's brief return on 1974's At Last, as yet the only Last Poets release still unavailable on CD. The remainder of the 1970s saw a decline in the group's popularity. In the 1980s and beyond, however, the group gained renown with the rise of hip-hop music, often being name-checked as grandfathers and founders of the new movement, often citing the Jalaluddin solo project Hustler's Convention (1973) as their inspiration. Because of this the band was also interviewed in the 1986 cult documentary Big Fun In The Big Town. Nuriddin and El-Hadi worked on several projects under the Last Poets name, working with bassist and producer Bill Laswell, including 1984's Oh My People and 1988's Freedom Express, and recording the final El Hadi-Nuriddin collaboration, Scatterrap/Home, in 1994. Sulaiman El-Hadi died in October 1995. Oyewole and Hassan began recording separately under the same name, releasing Holy Terror in 1995 (re-released on Innerhythmic in 2004) and Time Has Come in 1997. Their lyrics often dealt with social issues facing African-American people. In the song "Rain of Terror", the group criticized the American government and voiced support for the Black Panthers. More recently, the Last Poets found fame again refreshed through a collaboration where the trio (Umar Bin Hassan) was featured with hip-hop artist Nas album Untitled, on the songs "You Can't Stop Us Now" and "Project Roach." Individual members of the group also collaborated with DST on a remake of "Mean Machine", Public Enemy on a remake of "White Man's God A God Complex" and with Bristol-based British post-punk band the Pop Group. In 2010, Abiodun Oyowele was among the artists featured on the Welfare Poets' produced Cruel And Unusual Punishment, a CD compilation that was made in protest of the death penalty, which also featured some several current positive hip hop artists. In 2004 Jalal Mansur Nuriddin, a.k.a. Alafia Pudim, a.k.a. Lightning Rod (The Hustlers Convention 1973), collaborated with the UK-based poet Mark T. Watson (a.k.a. Malik Al Nasir) writing the foreword to Watson's debut poetry collection, Ordinary Guy, published in December 2004 by the Liverpool-based publisher Fore-Word Press. Jalal's foreword was written in rhyme, and was recorded for a collaborative album "Rhythms of the Diaspora (Vol. 1 & 2 - Unreleased) by Malik Al Nasir's band, Malik & the O.G's featuring Gil Scott-Heron, percussionist Larry McDonald, drummers Rod Youngs and Swiss Chris, New York dub poet Ras Tesfa, and a host of young rappers from New York and Washington, D.C. Produced by Malik Al Nasir, and Swiss Chris, the albums Rhythms of the Diaspora; Vol. 1 & 2 are the first of their kind to unite these pioneers of poetry and hip hop with each other. In 2014 Last Poet Jalaluddin Mansur Nuriddin came to London and also performed at The Jazz Cafe with Jazz Warriors the first ever live performance in 40 years of the now iconic "Hustlers Convention". The event was produced by Fore-Word Press and featured Liverpool poet Malik Al Nasir with his band Malik & the O.G's featuring Cleveland Watkiss, Orphy Robinson and Tony Remy. The event was filmed as part of a documentary on the "Hustlers Convention" by Manchester film maker Mike Todd and Riverhorse Communications. The Executive Producer is Public Enemy's Chuck D. As part of the event Charly Records re-issued a special limited edition of the Vinyl version of Hustlers Convention to celebrate their 40th anniversary. The event was MC'd by Poet Lemn Sissay and the DJ was Shiftless Shuffle's Perry Louis. 1971 - Right On! : Poetry on Film (Original Last Poets). Directed by Herbert Danska. 2008 - The Last Poets, made in Amerikkka (réalisation : Claude Santiago. France, 2008. www.lahuit.com). ^ Ankeny, Jason, Allmusic.com profile of Last Poets; URL accessed February 01, 2007. ^ - article in Blues and Soul (April 1981).